Click on the Link below to Register for 2018/2019 Travel Teams. The Lacrosse School offers a year-round program aimed at providing players with the best opportunity to play at the next level; whether that be Prep School or College (Division I - III including junior colleges/clubs) throughout the US & UK. 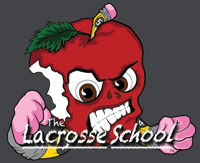 The Lacrosse School focuses on both individual player skill development as well as learning team concepts through the Rotten Apples & Little Apples teams. The focus is not only on lacrosse. Players are mentored, and provided guidance on life-lessons that directly parallel their academic and athletic experiences as “student-athletes”. For the 2018/2019 season, we will field boys teams for 3rd thru 12th graders. Click on the link below for program details. The "Apple" Family tent-house! Our boys are well taken care of at every event, Thanks to our awesome parents; WE appreciate your support!! We play a little "WOOF" over here!